"Sampath Speaking" - the thoughts of an Insurer from Thiruvallikkeni: remembering the blow out in Amalapuram 1995 ~ the sufferers !! remembering the blow out in Amalapuram 1995 ~ the sufferers !! Telugu movie Arya released in 2004 had Allu Arjun in the main lead. The song "Aa Ante Amalapuram" became famous in Andhra Pradesh giving Allu Arjun an identity. Amalapuram is a town, in East Godavari district in the state of Andhra Pradesh, 60 km from Rajahmundry city at Konaseema delta, the triangle formed by the waters of the Godavari River. I still remember that night in Feb 1995, when me and my colleagues of Oriental DO Kakinada travelled in a car. As we were getting nearer – from a few kilometres distance itself, I was able to see orange flames leaping above paddy fields – there were crowds visiting the place – the coconut trees in vicinity were scorched due to intense heat – someone suggested that one should not be seeing the flames with naked eyes and everyone was trying to hold dried coconut tree branches – heat could be felt as we went nearer – the flame was visible from a distance … it appeared that there was nothing till say 2 feet from the ground – then there was the flame, like a giant torch …. There were hoses directing water at the flames (do they use water ? or was that done to reduce the heat) – but hardly it could go near, it appeared that the water that went in an arch was vanishing midway, due to the intense heat………. I had in June 2014, posted about the loss of lives in the GAIL blast killing more than dozen of people in Nagaram village near Amalapuram in Andhra – the scene described in the first para is what we saw when a blow-out occurred in Jan 1995 and when Pasaralapudi village near Amalapuram became a tourist spot. It raged for about 45 days before Niel Adams, an expert from Russia capped the well. The KG basin (Krishna Godavari basin) is a proven petroliferous pericratonic basin formed on the continental passive margin located on the east coast of India; the basin reportedly contains about 5 km thick sediments with several cycles of deposition, ranging from Late Carboniferous to Pleistocene age. In those days (of Mid 1990s) it reportedly was a loss of more than 15 lakhs per day besides crores worth equipment damaged in the fire and that was at a time when Govt was actively speaking on disinvestment. It was blow out internationally spoke about – and certainly not the first nor the only of its kind. It put East Godavari on map to people hitherto unknown – at the same time exposing the unpreparedness of events of such magnitude. Whether it was gross negligence, faulty equipment, operator failure (human error), freak accident – none were sure – and there were reports of intensity flaring up 1 million cubic metres of natural gas a day, which was far excessive of the targeted flow of the well. In such intense heat, the property nearby too suffered – some houses reportedly cracked – for sure lot of vegetation and many birds suffered. Even in the recent blast, a newspaper report suggested that hundreds of birds got killed and many wounded. We read newspaper reports of an expert Neil Adams coming and papers were giving details of capping operations, though not too intelligible to commoners like me. 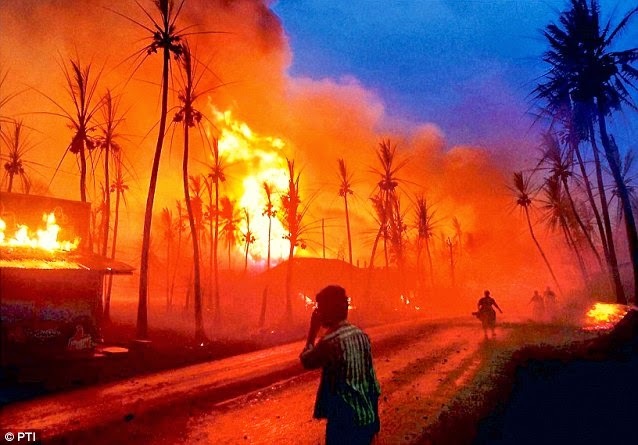 Adams was reportedly a veteran having put out many such fires in the post-Gulf War Kuwait and elsewhere, still the fire at Pasarlapudi was not to be doused in a day or two. Fortunately, there was no reporting of spewed toxic gases – in India any way there is not much of tort litigation, which in some other Country would have flared up in high numbers considering the effect it had on the locality. It was reported that the ONGC took four days to move equipment to train water jets at the fire, and by the time they started upping the pressure, the fire was weeks old and had risen more than 100 meters high. Read about the operation that a rig was placed to dig a relief well, into which the mud sludge was pumped in – and initially there were apprehensions and hurdles from the villagers on that. The water jets used cooled the surrounding area allowing the ace fire fighters to move in closer. – without commenting on the expertise of the operations, one thing was clear – it affected the villagers paddy fields, coconut trees, and the many shrimp farms in that area. A small % did some business selling products to many tourists who turned out to see the flaming torch. For sure, there are no comparisons, the present one is a massive blaze reportedly caused by a leaking gas pipelije explosion, killing people. In that earlier one, though crores were lost, not many human lives fortunately were. Times have changed – Firstpost reports that Andhra Pradesh Deputy Chief Minister N Chinarajappa, District Collector Neetu Prasad and GAIL authorities would distribute a compensation of Rs 3.80 crore to 19 people who lost their lives in the gas pipeline blast incident. Rs 20 lakh each will be given to the family members of the 19 deceased, who lost their lives on that day and the total amount of compensation will come to Rs 3.80 crore," it said, adding that Rs 50,000 each would be paid to 18 people who received severe burn injuries in the blast and are undergoing treatment at Amalapuram, Rajahmundry and Kakinada hospitals. The total amount of compensation for injured people will be Rs 9 lakhs. All payments will made in the form of Demand Drafts (DD) as directed by the district collector," it said. Most inputs about the GAIL blast taken from India today.